Abstract: Demodex folliculorum and Demodex brevis are two mites which infest the human eye and which may, in excess, lead to a wide range of anterior segment findings. Demodex mites have been implicated in anterior and posterior blepharitis, blepharoconjunctivitis, blepharokeratitis, and beyond. Due to significant overlap with other anterior segment conditions, Demodex infestation remains underdiagnosed and undertreated. Definitive diagnosis can be made with lash sampling, and the most common mode of treatment is with tea tree oil in varying concentrations. This article summarizes elements of pathogenesis, diagnosis, and management critical to clinical care of this common condition. On the other hand, infestation by these mites – deemed demodicosis – has been implicated in a variety of anterior segment conditions, where literature suggests a correlation between Demodex mites and blepharitis, changes to the eyelashes (loss and misalignment), conjunctivitis, keratitis, and basal cell carcinoma of the lid, among others.4,7 To bridge these findings, it has been suggested that density and overpopulation may play a role in tipping the anterior segment ecosystem from homeostasis to disease.1–4,6–9 Authors postulate a role for Demodex in a balanced ocular ecology, acting as lash cleaners by grazing on bacteria, defending against other mite species, and as immune regulators and buffers.5 However, as these mites proliferate in the proverbial “hard-to-reach” places of the eyelid (surrounded by the nose, brow, and cheek) and density increases with age (100% of the general population over 70 years of age has been shown to have Demodex mites), so do the ocular complications.3,6 This uncertainty leads to underdiagnosis and undertreatment of Demodex infestations. Combined with its comorbidities and ability to masquerade as a number of other ocular conditions (most notably recalcitrant herpetic keratitis), Demodex should be a top differential in the diagnosis and management of anterior segment inflammation. This article summarizes the current understanding of the pathogenesis, diagnosis, comorbidities, and treatment options for Demodex to help the eye care practitioners better manage affected patients. The Demodex duo can have multiple impacts on the anterior ocular surface, including anterior blepharitis, posterior blepharitis and meibomian gland dysfunction (MGD), ocular rosacea, and keratitis. The mechanisms of each species of Demodex are discussed below. D. brevis has been linked to symptomatic MGD, in part due to its predisposition toward the meibomian gland where it causes a primary mechanical blockage of the orifice.8 Accordingly, severity of MGD has been found to correlate with demodicosis by D. brevis and not by D. folliculorum.12 Accumulation of parasite excreta further contributes to this blockage and may also elicit a cell-mediated reaction.2 This blockage leads to filling, swelling, and enlargement of the gland. Demodex infestation is not isolated to the eyelid margins, eyelashes, and meibomian glands. The dermatology literature suggests that Demodex may also be associated with a multitude of skin conditions as well as basal and sebaceous cell carcinoma.3,15–17 Although argument exists as to whether Demodex of the normal skin flora does or does not in part cause the development of inflammatory skin eruptions, there is evidence for demodicosis of papulopustular rosacea, granulomatous-like rosacea, and blepharitis especially when Demodex density exceeds a normal threshold.18–20 In cancer patients who were taking epidermal growth factor receptor inhibitors, it was reported that Demodex mite colonization was increased which increased the risk of dermatologic conditions such as annular facial eruptions. There were also reported cases of Demodex folliculitis mimicking acute cutaneous graft-versus-host disease (GVHD).21–26 Tissue samplings of the affected skin tissue confirmed the diagnosis of Demodex in the suspected GVHD patients. Once Demodex was diagnosed and treated in these GVHD patients, the skin lesions cleared. D. folliculorum signs include cylindrical dandruff (CD) and eyelash disorders such as trichiasis, distichiasis, madarosis, and erythema of the eyelid margin.4,27 CD consists of fine, waxy, dry debris concentrated at the base of the lash and is considered pathognomonic of Demodex (Figures 1 and 2).4,7,27 CD indicates the presence of high-density Demodex mite infestation. Figure 1 Example of a patient with Demodex folliculorum. 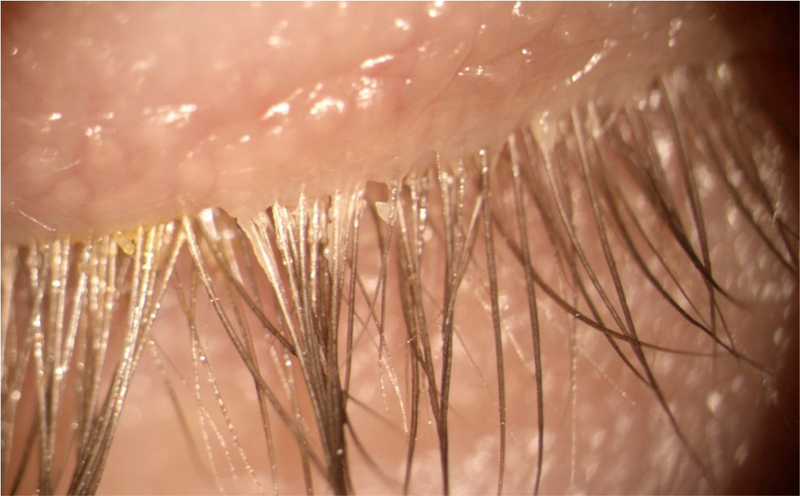 Note the cylindrical dandruff at the base of the eyelashes which are pathognomonic of demodicosis. Figure 2 Another example of a patient with demodicosis and cylindrical dandruff caused by Demodex folliculorum. Figure 3 Microscope photograph of an epilated eye lash showing Demodex folliculorum. Photography courtesy of Scott Hauswirth, OD. After sampling, the question remains what number of mites represents normal infestation versus pathognomonic overgrowth or what number of mites is required to elicit symptoms. Further research is needed in these areas. One of the primary goals in treating Demodex is to reduce parasitic overpopulation in the lids and lashes to decrease inflammation, providing a healthier environment for the ocular surface. While therapy for traditional blepharitis includes warm compresses and antibiotic/steroid combinations, these therapies do not eradicate Demodex, often causing the condition to persist.31 If left untreated – or when poorly managed – adverse effects such as redness, inflammation, telangiectasia, MGD, and ocular allergy may persist. In patients with skin sensitivities, tea tree oil may cause dermatitis, allergy, and ocular irritation, especially with higher concentrations.38 For this reason, it is recommended that treatment with high concentrations of tea tree oil (50%) be performed in office.39 The goal of the weekly office lid scrub with 50% tea tree oil solution it to stimulate the mites’ migration out of the lash follicle. This is then followed by daily home lid scrub with tea tree oil to prevent Demodex replication on the surface of the skin.35,40 Patients typically need to return for several in-office treatments of tea tree oil over the course of weeks to months in addition to performing daily home therapy. Mild cases are prescribed at-home treatments of once-a-day tea tree oil shampoo and facial wash.4 Moderate-to-severe patients are managed with weekly in-office treatments of high-concentration tea tree oil for 3 consecutive weeks and tea tree oil lid wipes or lid cleanser twice per day at home. In addition, every 3–6 months, severe patients may be treated with BlephEx™, a device by Rysurg utilized to remove the eyelash collarettes by a method known as microblepharoexfoliation.39 Microblepharoexfoliation involves removal of the biofilm on the surface of the lids and lashes using a high-speed rotary sponge soaked in lid cleanser.39 This also helps remove the eggs of the mites at the base of the eyelash follicle. Patients of all severity levels should also be instructed to discard their make-up, use hot water to wash their clothes, and dry linens on the high-dryer setting. Ocular Demodex is a common, but clinically underdiagnosed condition. From lashes to lid, conjunctiva to cornea, its effects can be widespread. 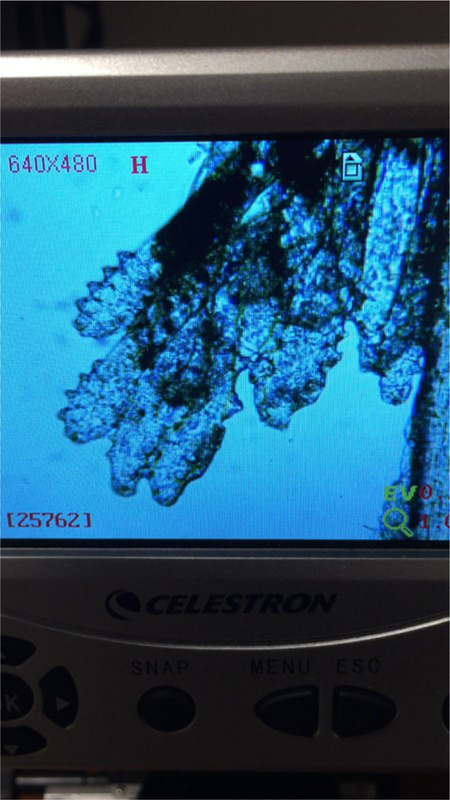 To identify Demodex as the underlying cause, lash sampling and microscopic evaluation may be useful, but clinical signs – especially CD – should also be considered. Failure to diagnose Demodex as the underlying cause of patients’ signs and symptoms may result in noneffective treatment, which can result in frustration for both the clinician and patient. Treatment to completely eradicate the mite is often unrealistic. More importantly, the goal of treatment is to reduce the overgrowth which will alleviate clinical signs and improve patient symptoms. Jennifer S Harthan serves as a consultant and advisory board member for Allergan and Shire Pharmaceuticals, key opinion leader for SynergEyes, and consultant and lecturer for Metro Optics. Dominick L Opitz serves as a consultant for Shire Pharmaceuticals and as a speaker and consultant for Bausch + Lomb. Stephanie R Fromstein and Jaymeni Patel report no conflicts of interest in this work. Kheirkhah A, Casas V, Li W, Raju VK, Tseng SC. Corneal manifestations of ocular demodex infestation. Am J Ophthalmol. 2007;143(5):743–749. Bhandari V, Reddy JK. Blepharitis: always remember demodex. Middle East Afr J Ophthalmol. 2014;21(4):317–320. Liu J, Sheha H, Tseng SC. Pathogenic role of Demodex mites in blepharitis. Curr Opin Allergy Clin Immunol. 2010;10(5):505–510. Luo X, Li J, Chen C, Tseng S, Liang L. Ocular demodicosis as a potential cause of ocular surface inflammation. Cornea. 2017;36 Suppl 1:S9–S14. Nicholls SG, Oakley CL, Tan A, Vote BJ. 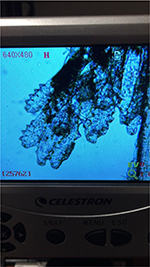 Demodex species in human ocular disease: new clinicopathological aspects. Int Ophthalmol. 2017;37(1):303–312. Post CF, Juhlin E. Demodex folliculorum and blepharitis. Arch Dermatol. 1963;88:298–302. Cheng AM, Sheha H, Tseng SC. Recent advances on ocular Demodex infestation. Curr Opin Ophthalmol. 2015;26(4):295–300. English FP, Nutting WB. Demodicosis of ophthalmic concern. Am J Ophthalmol. 1981;91(3):362–372. Gao YY, Di Pascuale MA, Li W, et al. 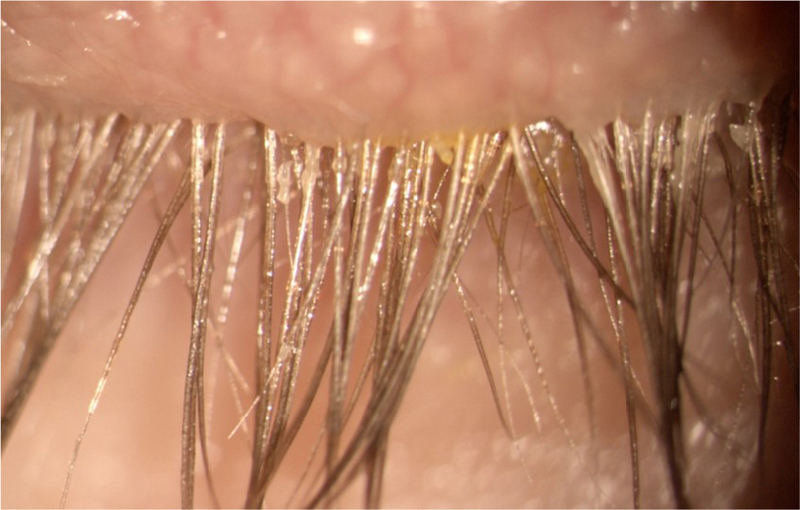 High prevalence of Demodex in eyelashes with cylindrical dandruff. Invest Ophthalmol Vis Sci. 2005;46:3089–3094. Liang L, Ding X, Tseng SC. High prevalence of Demodex brevis infestation in chalazia. Am J Ophthalmol. 2014;157(2):342–348.e1. Bevins CL, Liu FT. Rosacea: skin innate immunity gone awry? Nat Med. 2007;13(8):904–906. Liang L, Liu Y, Ding X, Ke H, Chen C, Tseng SCG. Significant correlation between meibomian gland dysfunction and keratitis in young patients with Demodex brevis infestation. Br J Ophthalmol. Epub 2017 Oct 21. Yam JC, Tang BS, Chan TM, Cheng AC. Ocular demodicidosis as a risk factor of adult recurrent chalazion. Eur J Ophthalmol. 2014;24(2):159–163. Liang L, Safran S, Gao Y, Sheha H, Raju VK, Tseng SC. Ocular demodicosis as a potential cause of pediatric blepharoconjunctivitis. Cornea. 2010;29(12):1386–1391. Erbagci Z, Erbagci I, Erkilic S. High incidence of demodicidosis in eyelid basal cell carcinomas. Int J Dermatol. 2003;42(7):567–571. Galea M, Sharma R, Srinivasan S, Roberts F. Demodex blepharitis mimicking eyelid sebaceous gland carcinoma. Clin Exp Ophthalmol. 2014;42(2):208–210. Morrás PG, Santos SP, Imedio IL, Echeverria ML, Hermosa JM. Rosacea-like demodicidosis in an immunocompromised child. Pediatr Dermatol. 2003;20(1):28–30. Elston DM. Demodex mites: facts and controversies. Clin Dermatol. 2010;28(5):502–504. Hsu CK, Hsu MM, Lee JY. Demodicosis: a clinicopathological study. J Am Acad Dermatol. 2009;60(3):453–462. Zhao YE, Wu LP, Peng Y, Cheng H. Retrospective analysis of the association between Demodex infestation and rosacea. Arch Dermatol. 2010;146(8):896–902. Aisa Y, Mori T, Tanikawa A, et al. Demodicidosis as a cause of facial eruption developing early after allogeneic hematopoietic stem cell transplantation. Transpl Int. 2008;21(12):1192–1193. Cotliar J, Frankfurt O. Demodex folliculitis mimicking acute graft-vs-host disease. JAMA Dermatol. 2013;149(12):1407–1409. Gerber PA, Kukova G, Buhren BA, Homey B. Density of Demodex folliculorum in patients receiving epidermal growth factor receptor inhibitors. Dermatology. 2011;222(2):144–147. Lotze C, Krüger WH, Kiefer T, et al. Facial rash mimicking cutaneous acute graft-versus-host disease after allogeneic stem cell transplantation for osteomyelofibrosis – was Demodex the culprit? Bone Marrow Transplant. 2006;37(7):711–712. Martinez-Diaz GJ, Clark KM, Vasquez JG, English JC 3rd. Facial erythematous annular plaques: a case of annular Demodex facial dermatitis? J Am Acad Dermatol. 2012;67(6):e268–e269. Román-Curto C, Meseguer-Yebra C, Cañueto J, et al. Demodicidosis simulating acute graft-versus-host disease after allogeneic stem cell transplantation in one patient with acute lymphoblastic leukemia. Transpl Infect Dis. 2012;14(4):387–390. Hom MM, Mastrota MK, Schachter SE. Demodex: clinical cases and diagnostic protocol. Optom Vis Sci. 2013;90:198–205. Coston TO. Demodex folliculorum blepharitis. Trans Am Ophthalmol Soc. 1967;65:361–392. Randon M, Liang H, El Hamdaoui M, et al. In vivo confocal microscopy as a novel and reliable tool for the diagnosis of Demodex eyelid infestation. Br J Ophthalmol. 2015;99(3):336–341. Kojima T, Ishida R, Sato EA, et al. In vivo evaluation of ocular demodicosis using laser scanning confocal microscopy. Invest Ophthalmol Vis Sci. 2011;52(1):565–569. Leibowitz HM, Capino D. Treatment of chronic blepharitis. Arch Ophthalmol. 1988;106(6):720. Gao YY, Di Pascuale MA, Elizondo A, Tseng SC. Clinical treatment of ocular demodecosis by lid scrub with tea tree oil. Cornea. 2007;26(2):136–143. Bielory L, Katelaris CH, Lightman S, Naclerio RM. Treating the ocular component of allergic rhinoconjunctivitis and related eye disorders. MedGenMed. 2007;9(3):35. Abelson MB, Gomes P, Smith L, Hollander DA. QoL Questions: Measuring Happiness. The importance of valid questionnaires when treating patients who suffer from ocular allergy. Rev Ophthalmol. Epub 2017 Apr 7. Gao YY, Di Pascuale MA, Li W, et al. In vitro and in vivo killing of ocular Demodex by tea tree oil. Br J Ophthalmol. 2005;89(11):1468–1473. Schachter S. A different approach to treating demodex blepharitis. Optometry Times. Epub 2014 Jan 3. Tighe S, Gao YY, Tseng SC. Terpinen-4-ol is the most active ingredient of tea tree oil to kill Demodex mites. Transl Vis Sci Technol. 2013;2:2. Koo H, Kim TH, Kim KW, Wee SW, Chun YS, Kim JC. Ocular surface discomfort and Demodex: effect of tea tree oil eyelid scrub in Demodex blepharitis. J Korean Med Sci. 2012;27(12):1574–1579. Murphy O, O’Dwyer V, Lloyd-McKernan A. The efficacy of tea tree face wash, 1,2-octanediol and microblepharoexfoliation in treating Demodex folliculorum blepharitis. Cont Lens Anterior Eye. 2018;41(1):77–82. Gao YY, Xu DL, Huang IJ, Wang R, Tseng SC. Treatment of ocular itching associated with ocular demodicosis by 5% tea tree oil ointment. Cornea. 2012;31(1):14–17. Ngo W, Jones L, Bitton E. Short-term comfort responses associated with the use of eyelid cleansing products to manage Demodex folliculorum. Eye Contact Lens. Epub 2017 Sep 21.